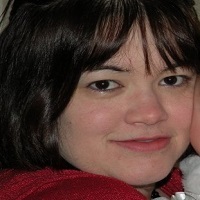 Today I’m welcoming fellow Wild Rose Press author Andrea Downing. 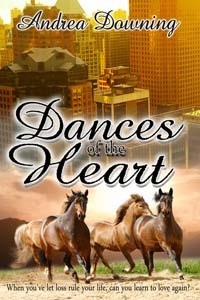 She’s going to share a bit about her latest release, Dances of the Heart and a few things about the writing side of herself. Welcome, Andrea! Our pleasure too. First off, a bit about you. Tell us when you knew you wanted to be a writer? When I was growing up, it was very much a toss-up as to whether to become an actress or a writer—I really did both until I went to England to do my MA, and got involved with a load of poets and other writers. That sort of sealed the idea once and for all. What things inspire your writing? Many things! I’ve had inspiration from a song, from an historic site, from scenery, and from my daughter, from biographies I’ve read and from people I’ve met. It’s difficult to discuss how a story evolves, but somehow, something plants the seed of an idea and it spreads branches into a novel. Who is your favorite character that you’ve written? Why? Debra, that’s like asking who’s your favorite child! I think a female romance author has to be at least a little bit in love with her heroes, and Jesse from Loveland, as my ‘first born’, will always have a place in my heart. He comes to understand Alex, the heroine, in a way we’d all like to be understood, and chooses his battles with her very carefully. I think they would definitely have a long and happy marriage. We all have our perfect setting for where we write, if not in reality, then at least in our heads. What would be your dream writing getaway? Jackson, Wyoming, is and probably will always be my dream getaway to clear the head and get down to business. I’m lucky enough to get out there twice a year for several weeks, take in the clear air and the magnificent scenery, submerge myself in the west and CREATE! Writers are generally great readers. Who are some of your favorite authors or what are some of your favorite books? On the romance front, I’m a huge fan of Maggie Osborne but sadly she no longer writes. I loved her Foxfire Bride, Silver Lining and The Promise of Jenny Jones. I also loved Julie Garwood’s Rose Hill books. I read a lot of literary fiction as well, and my favorites would be too numerous to mention really. Just finished Painted Horses by Malcolm Brooks and I really enjoyed that. Tell us a bit about this latest book. It’s a double romance but it’s really about learning to live with loss, and move on. There are four main characters, each of them carrying a burden of regrets and a certain amount of guilt, whether it’s guilt from something they’ve done or guilt for just being the one to survive. There are military themes in it as well as, of course, a western setting. It was a struggle to write but so far the reviews have been good. I hope your readers will give it a try. Blurb: Successful, workaholic author Carrie Bennett lives through her writing, but can’t succeed at writing a man into her life. Furthermore, her equally successful but cynical daughter, Paige, proves inconsolable after the death of her fiancé. Hard-drinking rancher Ray Ryder can find humor in just about anything—except the loss of his oldest son. His younger son, Jake, recently returned from Iraq, now keeps a secret that could shatter his deceased brother’s good name. On one sultry night in Texas, relationships blossom when the four meet, starting a series of events that move from the dancehalls of Hill Country to the beach parties of East Hampton, and from the penthouses of New York to the backstreets of a Mexican border town. But the hurts of the past are hard to leave behind, especially when old adversaries threaten the fragile ties that bind family to family…and lover to lover. Excerpt: “You still frettin’ over your body?” His words met her closing the bathroom door. He was right; she knew she didn’t give a damn what the hell he looked like. To her, he was the best looking damn man on earth. Worry about something else? “I have,” she finally answered him. “I should have phoned Paige again today. She sounded too crisp and business-like to me on the phone yesterday.” It was going to be a long night. Her mind was turning over too much. Ray stole a glance at the bedside clock. “She’ll be fine,” he assured her. “First thing tomorrow, you can call, but I’m sure she’ll be fine.” He lay back on the pillow. “Anyway, I didn’t know Paige had anything but ‘crisp and business-like’ when speaking. Seems that’s the way a lawyer should be…even with her mother,” he added quickly. He patted the bed beside him. Carrie curled herself in again as Ray switched off the low bedside light. “Yes. But then, if I were there, I’d be missing you, so which is worse?” She craned her neck to meet his gaze. A sudden feeling of contentment washed over her, and she curled up again, resting her head against him. For a while, she listened to the broken record song of the cicadas and frogs until that was joined by the soft whistle of Ray’s even breathing. But such satisfaction did not send her to sleep; it was a night when her mind would not rest and the restlessness won. Carrie slipped one leg down and then the other to stand and quietly make her way out the door, drawing it shut behind her. The hallway was pitch black, a night in which clouds blanketed the moon, and, like a criminal, she stole her way to the sunroom. Feeling for the switch, she inundated the room in the white light of the ceiling fan bulb and flipped the computer open, jabbing in her password and sitting, waiting for the home page to appear. And then the dogs started barking. Slipping back from the table, she rose to see if she could spot a deer that might have set them off as Jake had mentioned. The void of blackness was menacing, a complete emptiness of life as if she were the last person left on the planet. The glare of the light bulb and her own reflection forced her to lean right up to the cold glass, but nothing greeted her, a vacancy was all there was. She decided it was nothing more making them bark than a passing animal she couldn’t see, and she started to sit down when she became aware of something. Dogs were still barking, but it sounded like there were only two of them barking now, which puzzled her. They were barking more frantically, too, with a sort of whining cry emitted, a terrible yowling of desperation. And then came the screech of the kennel door. Hurriedly rising from her chair again, her heart pounding as if it wanted to escape her chest, Carrie rushed to the glass of the sunroom windows, desperately searching the emptiness for a sign of movement. The room’s reflections in the glass sketched specters outside, unnerving doppelgangers in an alternate world. Her hand instinctively went to her chest as she searched the void franticly. And then, two staring, disembodied eyes came floating through this ghostly setting and, catching the light from the room for a second, a knife held out, red stains of blood just dulling its sheen. Posted on October 14, 2015 October 15, 2015 Categories UncategorizedTags aging, life, The Wild Rose Press7 Comments on Welcome Andrea Downing! I really do love laughter. It’s one of the best sounds people can make. We don’t invest in it enough, in my opinion. That’s why humor is such an important element in my stories. There are even laughs to be found in the scary stuff. This story was my attempt at making laughter part of the scary stuff. 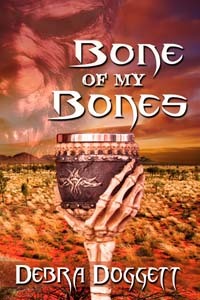 One of the most fun characters to write in Bone of My Bones was Mama Toulouse, the medium who hooks Rose up with Matthias the necromancer. She has an almost maternal relationship with Rose, which made for some great and funny dialogue. I hope to have lots more of her in Rose’s future adventures. I can’t think of a time where I wasn’t writing. When I was younger, it was just little bits of rhyming words that I’d write in cards for my grandmother. Later on, I remember winning a school writing competition and after the principal told me I should keep writing, I think my fate was sealed, it encouraged me to keep going. A little bit of everything. It could be a unique place I pass while walking or driving on the road or a conversation I hear—some of the stories I can tell just from things I hear people say! Who is your favorite character that you’ve written? Why? 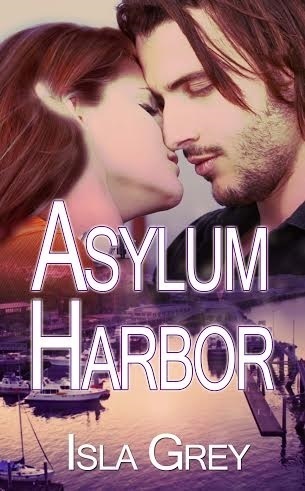 I think Kerr from “Asylum Harbor” has been my favorite. He’s good but not too good—he has that bad boy streak. He’s also the type of person who doesn’t let others too close to him, so he’s hard to know. You have to dig the layers away to find the true character underneath. What would be your dream writing getaway? I would love to spend a week at the beach during the summer where I can spend the days writing on a deck overlooking the water and I can walk the beach at night for ideas. Usually when I go on vacation, I get very little writing done. Who are some of your favorite authors or what are some of your favorite books? There’s so many! I’m a big fan of J.K. Rowling and the Harry Potter books. Right now I’m loving the “Miss Peregrine” books by Ransom Riggs. I also have a soft spot for Stephen King and Edgar Allan Poe for my macabre side. I also love some of the classics including “Jane Eyre” by Charlotte Bronte, which is probably my “go to” book and “Rebecca” by Daphne du Maurier. Tell us a bit about this latest book. Asylum Harbor tells the story of Devon Brown who packs up and leaves her home to become the new bartender of the Salty Dog on Shell Island. She’s not looking for trouble or romance, but she finds it in abundance when she finds herself falling for the brash and brooding harbor master, Kerr. Posted on September 29, 2015 Categories UncategorizedTags #writingwhilefemale, storytelling, Wild Rose Press; Isla Grey; Romance, writers, writing4 Comments on Welcome Isla Grey! It’s hard being judged. No matter whether it’s for your gender, your age, your body or any other surface aspect, knowing someone is looking at the outside of you and making determinations about what’s on the inside is discouraging, to say the least. People are like icebergs. We only see the tip and unless we take the time, we never know about the hidden depths below the surface. It’s easy, and lazy, to look at someone and determine their intelligence, their creativity, their life skills and their worth by an outer inspection, or even a casual glance. Such neglect robs the viewer of the surprise of true character. This is even more apparent for a writer. Characters need layers as much as they require physical descriptions. There should be hidden depths that add spark to the story and make the reader long for more. I would caution those who wish to hone their writing skills with an admonition: if you are depending on the surface to tell you about the inner person, then likely you are writing stereotypes and not real characters. Be careful you don’t judge away the best part of your story. Yep, that’s right. 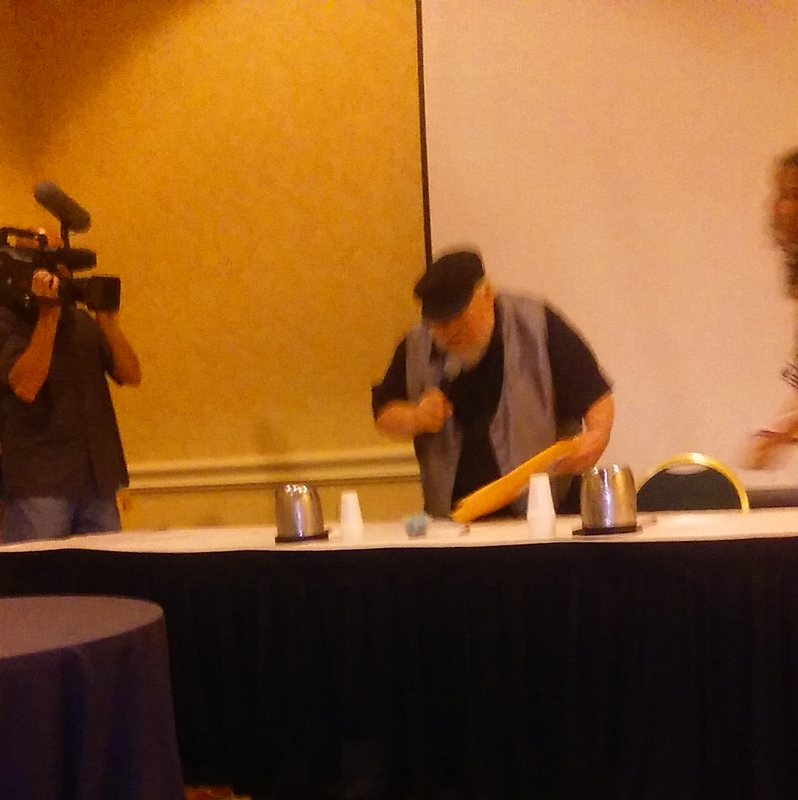 I got to listen to George RR Martin read me a chapter of his upcoming Winds of War. George had some advice for those of us struggling to write the stories we really want to: “Sometimes your muses f*^% with you.” Good to know. 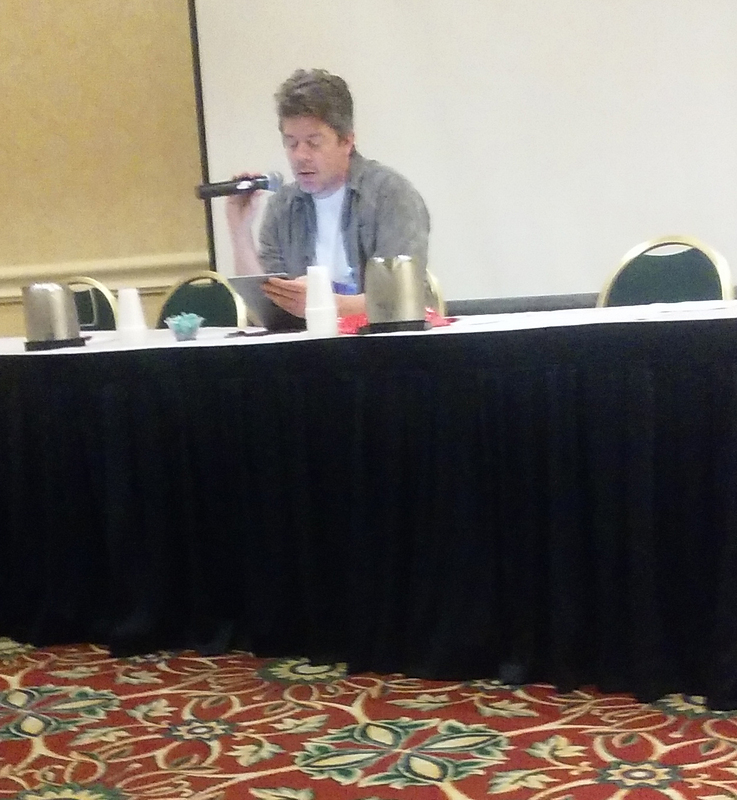 Besides George, Bubonicon offered lots of other great writers giving out advice. The best was another of my favorites, Daniel Abraham (who also is half of the writing combo of James S.A. Corey). It’s hard to keep plugging along some days. Other times it’s hard not to. Maybe that’s the meaning of being a writer.